The biggest arguement I'm reading at the moment in regards to pro-GMO, is that they are solving the world's food shortage crisis. Without the use of this technology, how on earth are we to feed the ever expanding population? And, to a certain extent, it's a valid question. If we want things to stay the way they are at the moment, where big corporations control most of the money and nearly all the food chain, then yes... mass produced chemically controlled staple cereal crops need to be produced much more efficiently and quickly than they are now. If we want to be slowly sedated, poisoned, and controlled by a small group of exceedingly rich people, then yes, your GMO's are the answer. And you can stop accusing me of over-reacting: eating a piece of corn injected with Roundup is poison, drinking water with fluoride is sedating, and making people ill from additives and over processed foods causing them to be continually sick and controlled by medications... is control. Let me spell it out for you: There is no food shortage. There is, however, a massive greed problem. If we only took what we needed, there would be plenty for everyone. So, now that you've read the basics from GMO'S 101 ... it's time to get a little deeper. Worldwide, there are A LOT of different crops using GMO technology. Tomatoes, Soybeans, Corn, Wheat, Rice, Potatoes, Sweet Potatoes, Zucchini, Papaya, Canola, Cotton, Sugarcane, Sugarbeet, Plums, Squash (pumpkin)... plus many more. Let's learn what they grow right here in Australia. You're probably wondering why GM cotton is such a bad thing, after all... we don't consume it! True, but what about the seeds? Let's take a step back and look at the big picture here. First of all, just because you don't eat cotton, doesn't mean the seed isn't produced. Cotton Seed Oil is used widely in cooking, and the seeds are also used in animal feed. Second, a GM crop of cotton does not mean it is not sprayed with any other chemicals (although, you would think that something as extreme as injecting a chemical into a seed to "protect" it would mean something...). Organophosphates are still sprayed on GM cotton crops in the later part of the growing season "because of the reduction in efficacy of Ingard plants" (Ingard being the patent name for the GM cotton). Allow me to interrupt this post to bring you up-to-date information regarding Organophosphates (of which I will be blogging about EXTENSIVELY very soon). They are the basis of many pesticides, herbicides, and nerve gases. They irreversibly inactivate an enzyme in the body which is responsible for nerve function, and this has been shown to occur in insects, humans, and other animals. Even at very low levels, they can have an adverse effect on the neuro development of the body; especially in regards to unborn babies and children. It can be absorbed by the lungs, skin, or consuming as food. It is used extensively in agriculture. The USEPA lists it as a possible human carcinogen (stopping short of labelling it as such, which would mean it would have to be removed from use...). You have to look at what is injected in the genome of the seed in order to predict what impact it will have on the body. In GM cotton, the Bt toxin, and Roundup-Ready technology are inserted (according to my research). The Bt toxin is a bacteria designed to kill its host. It is a very effective pesticide. In GM canola, Roundup-Ready (Monsanto corporation) technology, and InVigor (Bayer CropSciences) technology is used. They're both herbicides. Glyphosphate and glufosinate are very effective chemicals. And very potent. Stay tuned for posts relating to these technologies. I was going to put it in this article but for one, there is too much info to put in on post, and it's bloody hard to understand! So once I've deciphered it all, you'll be the next to know! The bacteria that is injected into not only Cotton but other genetically modified crops too (especially corn), is an agressive pathogen whos specific job is to cause disease in its host. Yep, it might kill off the insects it is designed to kill during the growing process... but we're involved in that too. Insects are already showing a resistance to the GM technology - so even though the chemical is inserted into the seed, the bugs aren't dying. And that's after only a few seasons of growing it. http://www.ncbi.nlm.nih.gov/pubmed/22504123 - proves that glyphosphate (use in Roundup-Ready GM technology) is the main environmental factor in human neurodegenerative diseases like Parkinson's Disease and Motor Neuron Diseases. http://www.greenmedinfo.com/blog/roundup-herbicide-toxic-fish-parts-billion-range - an article with many study links that shows Glyphosphate (found in Roundup and other herbicides) is extremely toxic in the parts per billion range; think of one drop of water in an entire swimming pool... a very small amount of this chemical. In this tiny quantity, Glyphosphate is still linked to genotoxic effects on animals and humans. Genotoxic means the chemical or other agent damages the DNA, resulting in mutations or cancers. http://www.greenmedinfo.com/blog/new-research-gmo-food-far-worse-we-think#comment-1135 - information on a recent study testing Roundup on human embryonic kidney cells, and rates between 1 - 20,000 ppm (parts per million - think about the one drop of water in a swimming pool. Between one drop and 20,000 drops... out of a million). They found that levels as low as 50ppm (50 drops in a whole pool) induced cell death. This is tested on human cells. The most amazing thing from this article was the statement "The researchers also found that the insecticidal toxin produced by GM plants known as Cry1Ab was capable of causing cell death at 100 ppm concentrations." This is the very specific toxin used in Bt GM technology. http://www.greenmedinfo.com/blog/surprise-monsanto-funded-research-finds-their-products-safe#_ftnref1 - be very aware of what research you read and where it came from. Seemily reliable sources often have their hands in the back pockets of multinational corporations who only want GMO's to succeed, regardless of the actual toxic impact on society. Yes, there are studies that say GMO's are safe - but they are lying to us. The studies are in no way accurate. http://www.ncbi.nlm.nih.gov/pubmed/21338670 - "This is the first study to reveal the presence of circulating pesticides associated to genetically modified foods in women with and without pregnancy, paving the way for a new field in reproductive toxicology including nutrition and utero-placental toxicities." This has the potential to explain why many more children are being born with allergies, diseases, DNA disruptions, and toxicity, and why many women are being affected by diseases and issues not seen in previous generations. Stay tuned for more (and there are HEAPS more, it just takes time to search and summarise!)!! So the big question, what do we do about it?! First of all, make a decision. If GMO's don't really bother you then good for you. At least you've made a decision. BUT, if the info you've read so far makes you a bit scared, angry, upset, or worried about your family's health, then you need to make some big lifestyle changes. Do you use cheap margarine? GM canola in your favourite spreads. Do you eat non-organic meat? GM ingredients in animal feed is very very common. Do you eat foods made in other countries (especially in the USA, where GM crops are everywhere)? Do you buy from companies who endorse GMO's? Or who financially support pro-GMO legislation and are against the GMO labelling campaign Right To Know? I think it's AMAZING that the first four companies in that list are all manufacturers of GMO's. Why would you create a product that you would want to hide from the consumer? Why be ashamed of what you create to the point where you invest millions of dollars to keep their inclusion a secret? 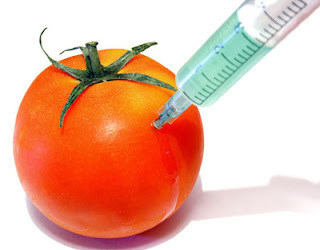 Why not be honest and open if, indeed, there is nothing to fear about GMO's? THEIR BEHAVIOUR MAKES NO SENSE, AND WE SHOULD BE REALLY WORRIED IF WE SIT BACK AND DO NOTHING. Step one, i know you'll hate me... but... BOYCOTT these brands. Step two, is petitions. We have the right to know if our meat is being fed GM grains, and if our products contain GM ingredients, or derivatives. Let us decide with our wallets. But we deserve the right to choose. Step three, stay in touch with this blog. Not only will you be getting info on what to avoid, but you'll be getting heaps more info on how to live the life you want, feel great, support mother nature, grow food without atrificial fertilisers or sprays... and whatever else you want me to research for you. If you haven't read it yet, here's the link to Part One. Let's get to know our colours a little more in depth. Please keep in mind that these effects are magnified in a developing child as their bodies are more susceptible to changes, and toxins like this build up over time, often showing up later in life or, worse, in the next generation through DNA damage (think childhood illnesses and birth defects). 102 - Tartrazine, FD&C Yellow #5. Banned in Europe, UK, and Norway. Used to colour beauty products, pen ink, crayons, vitamins, medicines, as well as food. Reactions include anxiety, migraines, blurred vision, itching/rashes, weakness, temperature fluctuations, feelings of suffocation, insomnia, clinical depression, and hyperactivity. Links to childhood asthma, thyroid tumours, genotoxicity, and chromosomal damgage (OMG OMG OMG!). 104 - Quinoline Yellow, Yellow 13. Banned in Europe, UK, USA, Japan, Canada, and Norway. Popular in sweet foods and soft drinks. When mixed with preservatives, 104 is shown to increase hyperactivity and decrease intelligence in children. It causes genotoxicity, dermatitis, urticaria, and rhinitis. 110 - Sunset Yellow, FD&C Yellow #6. Reactions include gastric upset, diarrhoea, vomiting, urticaria, skin swelling, and migraines. Also increases hyperactivity and decreases intelligence in children when combined with a preservative. Impurities of this colour (poorly produced, usually used in cheaper products) contain amines of such high proportions that they are considered carcinogenic (I don't throw that word around, this colour causes cancer). Also, a combination of this colour with at least one other increases the severity of the reactions. 122 - Azorubine, Carmoisine, Acid Red 14. It has been known as a carcinogen for 60 years, particularly in regards to bladder cancer. Again, it is shown to increase hyperactivity and decrease intelligence in children when combined with preservatives - particularly Sodium Benzoate 211. Enhances asthmatic symptoms. KNOWN CARCINOGEN. 123 - Amaranth, FD&C Red #2. Banned in USA, and Norway. Most commonly used in Glace Cherries, to give them that distinct shiny red colour. Female rats showed a great increase in malignant tumours when fed this colour. The USA ban in 1976 that still stands today is because of the strong links to cancer. KNOWN CARCINOGEN. 124 - Ponceau, Brilliant Scarlet, Cochineal Red A. Banned in Europe, US, USA, and Norway. It's a histamine liberator, so intensifies asthma symptoms. Wiki says "Ponceau is considered carcinogenic in some countries." So, what, are there different tests they run? It is also, again, shown to increase hyperactivity and decrease intelligence in children when combined with a preservative. As with 110, impurities contain such high amines that they are considered absolutely carcinogenic. 127 - Erythrosine, FD&C Red #3. Commonly used in lollies, popsicles, and cake decorating gels. It's also used to colour pistachio shells. High doses have shown increased tumours in rats. It has the lowest allowed dosage rate of the approved colourings, and is the most consistent "promiscuous protein-protein interaction inhibitor" (that basically means it interferes with proteins in the body). Given the lack of research, and the fact that the acceptable dosage rate is lower than some of our high-end chemical colours, i'd avoid this like the plague. 129 - Allura Red, FD&C Red #40. Like most modern artificial colours, it is made from petroleum. Also, like others, when combined with Sodium Benzoate it increases hyperactivity and decreases intelligence in children. It has been investigated as a reproductive effector in rats, with the results inconclusive... It easily mutates, and is linked with the development of bladder cancer. 132 - Indigotine, Indigo Carmine, FD&C Blue #2. This is the same stuff they use to dye your jeans blue. Yep. While it can be extracted from a leaf, mass production occurs synthetically. Used extensively in pharmaceuticals. Associated with nausea, vomiting, high blood pressure, skin rashes, breathing problems, and other common allergic responses. It is used in obstetrics to detect amniotic fluid leaks, and as a pH indicator. It is harmful to the respiratory tract if inhaled, and causes skin irritation. 133 - Brilliant Blue, FD&C Blue #1. It's derived from petroleum, and usually combined with tartrazine (102) to make a shade of green. Combinations of artificial colours are known to enhance symptoms (ie - it's worse when you mix the colours!). Increases the severity of asthma symptoms, it is not recommended for consumption by children. Causes hyperactivity and skin rashes, and has been firmly linked with chromosomal damage. Banned in USA, Japan, Canada, and Norway. Is an Azo Dye, so causes hyperactivity and decreased brain function. Derived from petroleum and/or coal. Commonly found in canned peas, mint jelly, mint sauce, cake mix, and packet bread crumbs. It causes asthma, rashes, and is a proven mutagen in animal testing (meaning mutating cells). 143 - Fast Green FCF, FD&C Green #3. Banned in USA, Belgium, Denmark, France, Germany, Sweden, Austria, Switzerland, Japan, Canada, and Norway. It has a high rate of allergic and intolerance responses, from mild rashes and irritation to full allergic reactions. It's particularly bad for people who are asprin sensitive. On top of that it is a histamine liberator, so it enhances the effects of asthma. It has been reccommended to be removed from the diet of children, citing major behavioural issues. Banned in USA, Belgium, Denmark, France, Germany, Sweden, Austria, Switzerland, Japan, Canada, and Norway. Very similar in reactions to it's good friend (151) Brilliant Black. Particularly bad for children in terms of enhancing asthma symptoms, and creating behavioural issues, and so is reccommended to be removed from their diets completely. 160b - Annatto, bixin, norbixin. Can be listed as natural. 171 - Titanium Dioxide, Titanium White. It's used to make things gloriously white. Everything from paints, plastics, papers, and inks to foods, cosmetics, sunscreens, and toothpastes. Inflammatory responses and genetic damage have been reported in mice. "The safety of the use of nano-particle sized titanium dioxide, which can penetrate the body and reach internal organs, has been criticised". There is firm evidence that says nano-particles entering the body can reach the brains of small animals. Those particles can lodge anywhere in the brain, and virtually not be removed, paving the way for anything from cancer to Alzheimer's. Why are these banned in other places and not here? Take another look back at what I've just written. The amount of articles I've read are endless. These people are making us SICK... KILLING us. Now there is no excuse to sit back and do nothing. Get this rubbish out of your diet. YOU deserve the BEST that life has to offer, not what some multinational corporation feeds you. We don't need these. At all. Food can either be your best form of medicine, or your slowest form of poison. Vote with your wallets, don't buy from companies who use this poison. Artificial colours are chemicals added to our food with one purpose - to make the colour more appealing. The Centre for Science in the Public Interest (CSPI) said "these synthetic chemicals do absolutely nothing to improve the nutritional quality or safety of foods, but trigger behaviour problems in children and, possibly, cancer in everybody." You know something is up when even the big companies begin to voluntarily remove artificial colours from their products (think of Aldi, and Sanitarium). These colours are really popular in products aimed at children, obviously to attract the child and engage them with the bright shades. By the end of this series of articles, you'll know what to avoid and why, and the products that are no longer welcome in our pantries. Remember: Every purchase we make is a conscious decision to vote one way or the other. If we all stopped buying products with artificial colours in them tomorrow, companies would stop selling them. We actually do have the power. Let's get one thing straight first - Artificial colours, in any quantity (no matter how seemingly insignificant), are completely and totally unacceptable, not to mention unnecessary and horrendously TOXIC. The science of food coloring evolved from dodgy and primitive technology. Chemicals containing arsenic, lead, copper, and mercury were used to colour everything from lollies to bread. Realising, eventually, that those chemicals were probably a poor choice, scientists created a new kind of dye derived from coal tar, a waste product of coal gas and coke. The synthetic dyes came to be known as coal-tar colours and they are what we still use today. If they're not coal-tar, they're petroleum derivatives. Lollies and sweets drenched in every colour of the chemical rainbow are NOT a treat for our kids, or us for that matter. To say they're even a "sometimes food" in an attempt to justify when we do buy them is only punishing them. We need to remember that the developing body of a child is far more susceptible to chemical exposure than that of an adult. The effect of anything on our body is measured by quantity vs weight; the amount of chemicals in relation to the size of the consumer. Sugar is a far less culprit in the behavioural issues arena when compared to the sea of artificial colours in the same packet of rubbish. Many of the colours that we see everyday on our Australian shelves (there are 14 artificial colours allowed to be used in this country, plus one "natural" colour that's just as bad as a chemical), are banned or at least restricted in other countries for various reasons. Some are found to have an "adverse effect of activity and attention in children", and there are certain colours that "interact with other additives such as MSG (Monosodium Glutamate 621) to interfere with the development of the nervous system." SAY WHAT?!?!??! You heard... when our precious children eat foods that contain both MSG (621, and let's be honest, all its cousins - 620, 622, 623, 624, 625, 627, 631, and 635, not to mention the countless derivatives like malt extract, yeast extract, hydrolysed vegetable protein, maltodextrin, etc) and artificial colours, it DISRUPTS THE DEVELOPMENT OF THEIR NERVOUS SYSTEM. Foods with artificial colours must be removed from your house right this instant. Did you know that your favourite pack of Arnotts Tim Tams contains 5 different artificial colours (150c, 129, 110, 133, and 102)?? To make the colour brown?? 4 out of 5 of those colours are banned in other countries. The European version of Tim Tams are sold with a meagre 1 artificial colour in them. I say it again, if we all stopped buying these toxic foods, the company would be FORCED to create a safe option. What you need to remember, is that food is our fuel. What we put into our body affects everything we do, every way we behave, the way we think, and our reactions to our experiences. If chemicals are put into our body, they will negatively affect all of these aspects. It's really important to understand and appreciate the absolute links between our bodies and our environment. Everything around us affects us, and if you want to make a positive and healthy change in yours and your family's life, this is a great way to start. Hopper foods says "the effects of the consumption of food additives may not always be immediate and may manifest in many ways and parents or doctors may not always make the connection. It is the long-term cumulative, subtle effects of additives in our diets that we need to be concerned about." The EFSA (European Food Safety Authority), for example, have said about colouring number 127 (Erithrosine) that based on a 14 day experiment showing no adverse effects, there was no reason to revise the current level of allowed exposure to this colour. See the problem? Allowances made based on short experiments when the real issues occur mid to long term, and often when combined with other chemicals. Many chemicals and additives are put into our water supply, and quantities vary from town to town, state to state and country to country. We’re told that these are a necessity to prevent bacteria, micro-organisms, and viruses. But what we’re not told is that these chemicals are either directly or indirectly causing us damage. Everything from irritable bowel and gastrointestinal distress, to headaches, to asthma, and cancers. Fluoridation (the process of adding fluoride to a town’s water supply) began in the 1940’s, in a bid to reduce tooth decay and cavities in a society that was drastically increasing its sugar and processed foods consumption. Any research that suggests positive results from fluoride in regards to dental health is speaking specifically of topical applications. As in, when fluoride is applied to your teeth then removed without being ingested (swallowed), there is a reduction is tooth decay. The MASSIVE problem is, when you drink your 2L of water a day, where that fluoride is going and what it is doing to your body. Firstly, adequate and acceptable amounts of fluoridation are listed as between 0.5 – 1.0mg/L (milligrams per litre), although measurements can vary greatly and accuracy and consistency are not guaranteed. These are statistics given to us by the same people who fluoridate our water, so is any level of ingested fluoride acceptable?? At the very basics, fluoride causes fluorosis, a condition causing discolouration of the teeth from white spots to very dark smudges. It also causes an increased porosity of the enamel (larger pores), and in advance conditions can result in chipping, pitting, fracturing, and decay. Seems strange, no? I thought this stuff was supposed to help our teeth? Oohh I get it – topical fluoride can help your teeth, ingested fluoride can harm your teeth from the inside. Fluorosis occurs in more than 30% of American children now, with statistics getting higher as time goes on. As noted by Dr. Hardy Limeback, Head of Preventive Dentistry at the University of Toronto, "it is illogical to assume that tooth enamel is the only tissue affected by low daily doses of fluoride ingestion." Meaning, if it’s affecting the teeth, what else is it affecting?? According to the Physicians Desk Reference, 1% of the population (that’s around 220, 000 Australians) have a hypersensitivity to fluoride, an allergy. Reactions include skin rashes, mouth lesions, gastric distress, headaches, joint pain, weakness, visual disturbances, and lethargy. Any of these symptoms ring a bell?? Probably… The symptoms vary from person to person, that’s why it’s so hard to diagnose things like this and other dietary issues. Chlorine. It’s added as a disinfectant. So bacteria, micro-organisms, viruses, and anything else is destroyed. Simple? Except the by-product of this process produces trihalomethanes (THM’s), which are carcinogenic. So the solution is to change to Chloramine (part of the Hydrogen component of Ammonia (NH3) is changed to Chlorine) as a disinfectant, because it is much more stable and “does not dissipate from the water before it reaches consumers.” The tendency to convert organic matter into carcinogens (as in chlorination) is much lower with this process, but is less effective as a sanitiser, and more irritating to swimmers’ eyes when used in swimming pools. Hang on, the cancer causing stuff is much lower with this process?! So, what’s wrong with Chloramine then? I’m glad you asked! Wiki says in regards to Chloramine: “These methods of disinfection decrease the formation of regulated byproducts such as alkyl chloroforms, which has led to their widespread adoption. However, they can increase the formation of a number of less regulated cytotoxic and genotoxic byproducts, some of which pose greater health risks than the regulated chemicals, causing such diseases as cancer, kidney disease, thyroid damage, miscarriage, and birth defects.” Sooooo, some toxins are more regulated than others. The less regulated ones go through unchecked and are often more dangerous than the regulated chemicals! Chemical spray runoff from crops easily gets into rivers, groundwater supplies, and dams. They last for years without breaking down, not only damaging the soil but the water it infects. Filtration and treatment processes in catchment areas often don’t treat for a lot of the chemicals used in farming today. Yet another reason to support organics, you’re supporting those farmers choosing to keep chemicals out of our grounds and water supplies. Logic, really. These contaminants will generally get into your water when it’s on its way to your house. The galvanised pipes underground, especially in older suburbs, are extremely prone to rusting, copper pipe corrosion, and lead leaching. Increased levels of these metals in your system result in developmental delays in children, liver issues, and brain dysfunction. 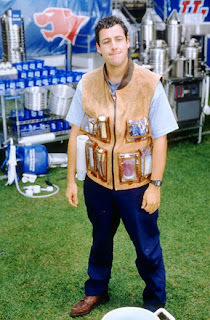 http://www.noblebeverages.com/net/water-and-you/ - This is an AMAZING article, with much more in depth analysis than what I have written here, it’s quite shocking actually. Please, please, PLEASE take the time out to read what is here!! Boiling for at least 20 minutes can get rid of harmful bacteria, as well as ammonia and chloramine. Let’s be honest, if you can’t get a filter or a tank yet, it may be monotonous but it is actually a good option. Get your soup pot out, fill it with water and bring it to the boil. Let it cool and fridge it for the day. Seriously. Go back and read about chlorine and chloramine if this sounds silly, because what it does to your body is anything but. You’ve just got to make a decision, do you actually want to feel good? As far as I have researched, the polyethylene used in the manufacture of fiberglass tanks is safe. If the plastic is heated to over 120C you have problems, other than that it’s fine. They are also UV protected. Concrete tanks are fantastic, although probably the most expensive to install. You can install them underground if you like, which is fabulous for keeping it at a cool temperature. Stainless steel tanks are also expensive to start with, but if you want quality and durability, this is a great option to go with. Google rainwater tanks in your nearest large town or capital city, or if you need additional info, ask me! Prices vary immensely, depending on the size, and what material you get. Get one. Even if you have a tank. The thing is, there is still the possibility of contamination in your tank… from bacteria, mosquito, runoff from your roof, etc. Ideally, you’ll want a filter that does “reverse osmosis”, especially if you decide not to get a tank. This is the only way to get chemicals and toxins out of your water. Reverse Osmosis is the only way to get efficient filtering of fluoride and chlorine, as well as all the other nasties. According to consumer review websites, PSI Filters is the way to go. They have an impressive track record and the least amount of complaints regarding durability etc. In terms of going natural, holistic , and organic, effective water filtration is the first and most important step. Our bodies need water more than anything else to perform at it's peak, so if you're going to bother with only one thing, let it be a high quality water filter, for some high quality H2O!! Ok, so you’ve decided to explore the natural world a little bit more. You know the foods you eat and the products you use at the moment aren’t quite right, and the advertising just isn’t convincing you anymore. Maybe you’ve seen a couple of news reports about the links of certain diseases to certain things we use and consume. So you start to google it, and my oh my did you find a gold mine of information! But where do you start?! We can do this. It is challenging, but the reward will be your perfect health. It’s time to gather up as much info as we can, present it in a step by step manner that is easy to understand and backed up by trusted sources and scientific studies, and put it all in the one place. There are so many wonderful sites and fabulous people out there whom I am learning off, and their blogs and websites will be flashed all over the place, and I will encourage you to support them as much as me because their influences and information are what started my passion for organics. The more I read, the more I am shocked – not only at the sorts of things that pass for foods and products these days – but the lengths that multinational corporations will go to in order for us to NOT know what they are doing, and deceive us into thinking they are helping us. They aren't. There is something wrong with what we consume. There is something wrong with the products we use each day. There is proof that ingredients within these items cause everything from cancer to neurodegenerative diseases to obesity to infertility. There is proof that our DNA can be altered by the chemicals in these products. From here, you should go to the index page. At the moment, I am setting up a 10 step strategy to get you easing into the world of organics – explaining why it is so essential, who the worst offenders are, when organics aren’t organic, where to get what you need, how to start a garden (oh it’s not hard! )… everything you need to get started. When that’s ready to go, after you’ve gone through the ten steps, you can be free to explore the blog via the index page, and learn as much as you can about what goes into your precious body each day! There will also be many other posts after the initial 10 to help with the transition, and i will also be updating the posts as i get more information... so make sure you have fun, and don’t forget to join my facebook page and get all the updates, and if you have any questions at all, I’d be more than happy to discuss them. One last thing, a bit of a disclaimer of sorts. I’m not a doctor, dietician, nutritionist, herbalist, nurse, dentist, horticulturalist, or botanist… I’m not an anything! I don’t have a degree and I’m not forcing you to do anything. I’m relaying information I have found from what I feel to be extremely reliable sources. If you don’t like it, don’t read it. I don’t know anyone else’s present medical condition so, as always, go and consult with your trusted professional before you change things. There. WHAT IS IT? Also list what else it is called. Now, benzoic acid is a better preservative, but 211 is created because it is much more soluble (200 times more, to be precise) and therefore more widely adaptable and can be produced en-masse. WHAT’S IN IT? (OR) WHAT IS IT IN? This little doozie is a very popular preservative used in soft drinks, salad dressing, sauces, shredded cheese, salsa, dips, jams, picklings, pet foods, fruit juices, as well as in cosmetics and medicines, and as a fuel in fireworks (you know the whistling sound? Yep. Compress and ignite our buddy 211 and he whistles!). Basically, in food terms, anything acidic (less than 4.5 pH) that needs to be preserved will have 211 in it. It’s a cheap way to make an effective mould inhibitor in acidic products. It’s also really popular as an anti-corrosive additive to automotive engine antifreeze coolants, as well as being made into plastics such as polypropylene to improve strength and clarity, AND in photographic processing. Pretty impressive resume hey?! Bon Appetite! I am going to compile a list of as many products as I can that have 211 in it. If you’re shopping and you see it – leave a message here or on the Facebook page and I’ll put it on the list! This preservative is made by neutralising benzoic acid with sodium hydroxide. Does that mean much to you? Me neither, but at least we know now! The important thing to know is that it is completely and totally artificially produced in a laboratory – and is not processed by the body in anyway similar to its natural long-distant second cousin, benzoic acid. WHAT DOES IT DO TO OUR BODIES? The problem is that Sodium Benzoate can be found in products that are labelled “all natural”, and they’re trying to fool you into thinking that the naturally created benzoic acid found in low levels in many fruits is the same thing. 211 is synthetically produced in a lab, and put into thousands of products that we consume. If sodium benzoate (or potassium benzoate, for the record) is combined with ascorbic acid (vitamin C, has the number 300 on the label), you produce benzene. Now, benzene is a KNOWN carcinogen. Think of those lovely fruit juices you buy and remember this: 300 + 211 = CANCER. The argument is that benzene levels are considered low enough for safe consumption… but… ahem, excuse me… since when did any level of carcinogenic chemicals become acceptable?! I bet the clowns that do the recommending don’t drink it. Heat exposure and shelf life can also affect the amount of benzene that is created. Recent studies by a professor of molecular biology at Sheffield University, Peter Piper (in between picking packs of pickled peppers), found that sodium benzoate severely damages certain parts of our DNA. Get rid of it, and tell your friends. We don’t need it. WHAT ARE THE SAFE ALTERNATIVES, WHERE CAN I GET THEM, AND WHAT WILL IT COST ME? In terms of soft drinks, just stop drinking them – they’re awful and contain a whole cocktail of chemicals and poisons that make you fat, moody, and sick. You’ll save money too. And I’ll get back to you about the rest; just remember for now that 211 is an absolute NO NO. Go through your pantry and fridge and get rid of it. Ooohhh, I was even debating whether or not I should bother with this post. We all should KNOW these things are probably the worst things you can put into your body. They’re one step away from an illicit drug, I’m sure. Deep down, we all know. These so-called experts, professionals, addicts, and opinionated fact-givers (aware the pot could be calling the kettle black here, but I assure you though I may be opinionated I’ll always give you an honest answer and work with logic, as well as facts) all have the same information on their sites. They list the ingredients regularly found in these drinks, and go on to describe why each individual ingredient is beneficial in our body. How it is either organic or is of no harm if taken in excess or produces all these fabulous mind enhancing and energy building effects. Oh sure, they go on to say that moderation is the key, and kids and pregnant women shouldn’t have them… but not many will out and out say what they should. You do get the odd site that is spot on with their recommendations though: don’t touch the stuff. 1. Caffeine is a stimulant. 2. D-Pantothenol improves moods and energy. 3. Niacin metabolises energy (turns carbs and fat into energy). 4. Inositol has mood boosting effects (it’s used in Prozac for goodness sake). 5. Vitamin B12 produces energy by breaking down fat and protein. 6. Glucose, sucrose, dextrose (and any other sugar derivative) is sugar. It is DIRECTLY converted to energy. 7. Guarana contains caffeine, and is thus an effective stimulant on two levels. 8. Ginseng enhances the effects of caffeine, while also being a highly effective stimulant. 9. Glucuronolactone is used as a stabiliser. 10. L-Phenylalanine is an analgesic (painkiller) and an anti-depressant (and carcinogenic!). 11. Taurine improves athletic and mental performance. Now, mix all of that together at the same time, or at least a really nice collection of them. Add alcohol (which enhances the effects of most of these ingredients, as well as having its own effects), or an empty stomach, or an already depleted and strained body, or a developing body (think kids and teenagers)… see my problem yet? It’s too much at once. It’s too drastic. and the companies responsible are making a mint. The only difference between these drinks and illicit drugs, is that drug dealers were too stupid to market their stuff in effective packaging and advertise all the energy enhancing benefits of it. This stuff in its natural form, ingested from its original source (whether it be fruit, veggies, plants, meat, breast milk, fish, whatever) and consumed individually, is probably good. Produced artificially in a lab, mixed with artificial sweeteners, artificial flavours, artificial colours, mixed with a whole host of other artificial rubbish and tossed in a can should be ringing alarm bells for EVERYONE. Caffeine blocks adenosine, a chemical released by the brain to induce sleep. Since one standard sized can (250ml) energy drink contains roughly the same amount of caffeine as 2 cups of strong coffee (remember, guarana contains caffeine too), your brain very quickly releases adrenaline in response to its “fight or flight” reflex. Adrenaline causes your pupils to dilate, increased heart beat and palpitations, your liver releases extra sugar, and dopamine to be released by the brain (a chemical from the ‘pleasure centre”). Caffeine is also a diuretic – meaning it dehydrates you. So caffeine stops your body’s natural desire to rest, and on top of that the rest of the stimulants now can run free in your body without meeting any natural bodily defences. Just imagine, all of those stimulants at once. No wonder people have heart issues from them. Not to mention the ghastly effect that all that sugar has on your systems. The other thing we just don’t know is how these ingredients interact and react with each other. In their own right they are all effective stimulants. But mixed together? Who the heck knows what they can do. Some of these ingredients are known to increase your libido, some your sense of euphoria, some increase general mood, some your athletic performance and stamina, some are painkillers… all at once. Then, you have to come down from that high, and it’s usually a crash landing. Then you need another one. 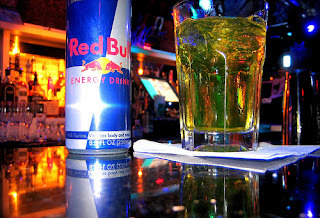 These drinks contain known carcinogens, and a toxic cocktail of stimulants. And just in case you were wondering… sugar-free energy drinks are NOT your answer. Why? Because artificial sweeteners are carcinogenic. Acesulfame potassium, Aspartame, Saccharin, Sucralose… so you’re no better off with the sugar-free variety at all. It’s just more chemicals – KNOWN chemicals – that cause illness and cancers. All of this stuff negatively affects your brain, your systems and your health. That much is known. 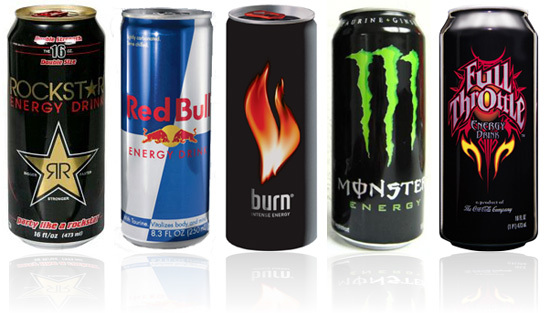 Even the companies that make “energy drinks” recommend no more than two 250ml cans per day. And that’s the company saying that. How many do you think you have over the course of a night out? Plus your usual swag of grog? Do you need one every day just to get through? Or maybe two? For the sake of yourself, don’t ever buy these again. Your heart and brain(not to mention the rest of your body) will thank you for it. This is your port of call! If you get stuck or want to find something – you should be able to find it in here. I will be categorising my posts to make it a lot easier to find what you want to learn more about, so at the bottom of this post you will have each category, with the relevant posts linked under it. Obviously as the site gets bigger, I’ll change the layout a bit but the general idea will remain the same! If there is something you want to get to the bottom of that hasn’t been covered yet, just flick me an email and I’ll get onto it. This isn’t just a blog for me, it’s for everyone.